With a last, anxious glance at the notes in his hand, Mike Nagle launches into his pitch. "Hi, I&apos;m the owner and founder of Amp Welding Service, where we fit it right and weld it tight," begins the tall, muscular Nagle, his weight shifting from foot to foot. "We&apos;re a welding company serving the oil and natural gas industry." Nagle barrels along into a breakdown of the business&apos; revenue model as Catherine Rohr, looking every inch the corporate professional in her perfectly creased pinstriped pants and white shirt, takes careful notes. The presentation — which aims to get investment for Nagle&apos;s business and comes complete with detailed profit-and-loss projections and market analysis — sounds like a lot of pitches Rohr has heard in corporate meeting rooms from New York City to Silicon Valley. But this one is a little different. It&apos;s taking place inside a Texas prison, and the prospective entrepreneur is serving four years for sticking up a stranger in a parking lot. Rohr, a slender 31-year-old with glossy, shoulder-length auburn hair, used to be a high-flying executive in the venture capital industry, advising wealthy investors on which businesses to support. Now she offers her expertise to a much less likely group of entrepreneurs. 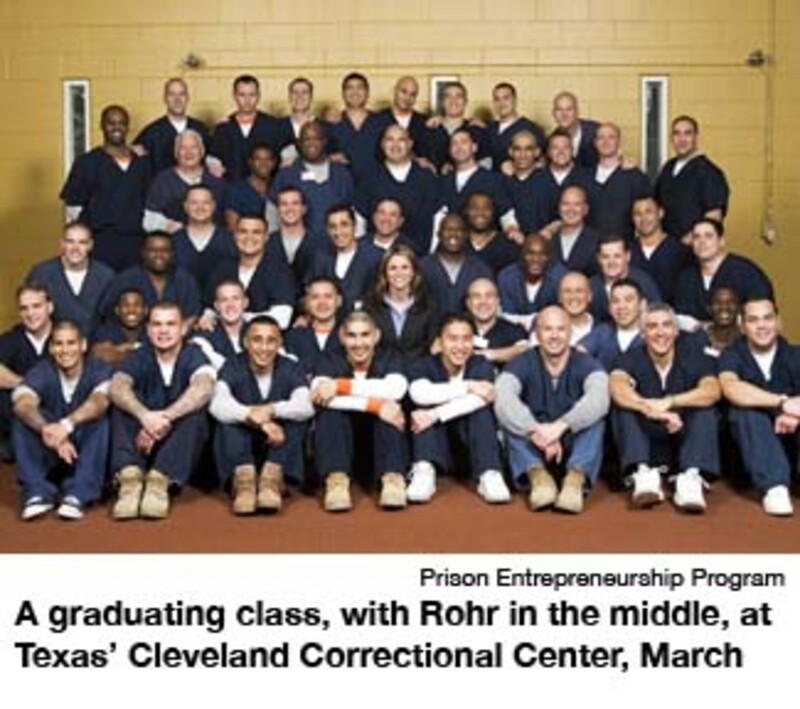 Rohr left her old life four years ago to start the Prison Entrepreneurship Program, a nonprofit that teaches incarcerated would-be Horatio Algers to apply their talents to the legitimate marketplace. After all, assessing risk, handling cash flow and managing distribution networks are as important to succeeding on a drug corner as they are in a corporate corner office. "These men aren&apos;t locked up because they were bad businessmen," she says. "They&apos;re locked up because they lacked moral values." So far, the program has put 440 male inmates through four months of classes in which volunteer executives and MBA students from the likes of Harvard and Stanford help them develop business plans. Applicants are carefully screened. They must be within a year of their release, renounce gang affiliations and submit to several tests and interviews. Only about 1 in 7 is accepted. Nearly half are kicked out over the course of the program for infractions ranging from cheating on tests to maintaining gang ties. PEP also provides crucial support after release. Staff members pick up each graduate at the prison gate and help him find a place to stay. At the organization&apos;s headquarters in a north Houston office park, program grads choose suits from a room full of donated business clothes. Post-release classes and mentoring opportunities are available. Rohr and her husband even take the men out to the beach or the movies sometimes and organize holiday parties for them. By the organization&apos;s count, almost all of the program&apos;s graduates have found jobs after their release, and 57 have started their own businesses, ranging from landscaping to dog training. Just shy of 9 percent have so far wound up behind bars again — an impressive statistic in a state with a recidivism rate of around 30 percent. "No question, it&apos;s an innovative model with a lot of promise," says Amy Solomon, a researcher at the Urban Institute specializing in prisoner re-entry issues. That record is bringing the program major support. The Texas Department of Criminal Justice gave it an award for being the state&apos;s "most innovative" volunteer program in 2007. The group&apos;s budget, donated by individuals and foundations (including a recent $750,000 grant from the Harry and Jeanette Weinberg Foundation), swelled from nothing in 2004 to $2.5 million last year. PEP now has 26 employees, many of them program graduates. PEP is one of a handful of initiatives that have sprung up around the country in recent years to teach inmates business skills as a way to boost their chances for success after release. The need is certainly there. The number of prisoners in the United States stands at a record high of nearly 2.3 million — more than any other country on Earth. Every year, 650,000 of those convicts are released. But within three years, studies show that upward of half wind up back behind bars. Rohr thinks that if more of them knew how to make money legally, more of them would stay on the outside. Rohr grew up comfortably in Northern California, the daughter of a Stanford engineering professor and a stay-at-home mom. But she&apos;s hardly a shrinking violet; as a teenager, she was a state wrestling champ and later won a national jujitsu competition. After earning a business degree from the University of California, Berkeley, she dove into the demanding world of venture capitalism. "She was unusually focused for someone her age," says Peter Chung, a managing partner at the Palo Alto firm Summit Partners, who hired her right out of college. Rohr&apos;s goals in those days were straightforward. "My life was all about me, making more money and getting a bigger house," she says. Things began to change when she was 25, she says. She and her husband, Steve Rohr, a lawyer, started attending the River Church, a Bay Area house of worship with an emphasis on social justice work. Rohr&apos;s Catholic upbringing had never meant much to her, but her new pastor convinced her to start "living a life of loving God," as Rohr puts it. That year, she and Steve volunteered on a church-sponsored trip to work with HIV-infected orphans in Romania. "It was the first time I had been away from my Blackberry and all the other comforts of my life. And it was the first time I&apos;d had injustice really in my face like that," she says. Something in her responded deeply. She began looking for a way to help others full time. Soon afterward, the couple moved to Manhattan where Rohr took a new job with American Securities Capital Partners. In her spare time, she studied philanthropy at New York University. In April 2004, a friend invited her to tour some Texas penitentiaries with the ministry of former Watergate conspirator Chuck Colson. Rohr had never been in a prison or met a prisoner in her life but had strong opinions about them. "I was totally the &apos;lock &apos;em up and throw away the key&apos; type," she says. But the trip changed her outlook and ultimately her life. To her surprise, the men she encountered inside were polite, well-behaved and often highly intelligent. "I thought I was going to see caged animals, but instead I saw other human beings," she says. "I was really ashamed of how ugly and closed my heart had been. I realized I didn&apos;t believe these guys were worth redemption." Her other big surprise was learning how businesslike criminal gangs are, complete with the equivalent of management teams, pricing strategies and bookkeepers. "These guys had the exact profile of the entrepreneurs I pursued in venture capital," Rohr says. "It&apos;s just that their business had been illegal. So I thought, &apos;What if we equipped them to use their skills for good?&apos;"
Rohr went home, worked her Rolodex and returned a month later. This time she brought along a volunteer group of executives who delivered a two-hour business training seminar at the Carol Vance Unit, a low-security facility Rohr had visited on her tour. Fifty-five inmates showed up. She followed up by designing a competition for prisoners who had created business plans. A few months later, she and Steve quit their jobs, cashed out their 401(k)s and moved to Texas so Rohr could devote herself full time to launching PEP. "I was highly surprised," says Glenn Kaufman, her former boss at American Securities. Rohr was making six figures at the time. "When someone tells you they want to leave their career and where they live to go do something like that, you can say either, &apos;You&apos;re crazy&apos; or &apos;You&apos;re talented, so there must be something to this.&apos; My reaction was, &apos;Wow. Tell me about it.&apos;" Kaufman now serves on PEP&apos;s advisory board. Rohr and her husband worked together at first, but he later took a job at a local law firm; his income, along with Catherine&apos;s modest salary, allowed them to move into a stately brick home near a golf course. But it wasn&apos;t easy getting started. The Rohrs first rolled into Houston at 1 a.m. in a rented minivan filled with of all their belongings. Too tired to unload, they left the van parked on the street. By daylight, everything had been stolen. The program had to be built from scratch, with volunteer labor, in the face of skeptical prison officials and constant personal disappointments for Rohr. Several students borrowed money from her and then vanished, or stole things outright. More than a few have slipped back into addiction, crime and incarceration. "The last four years have been the most difficult, gut-wrenching, tear-jerking of my life," Rohr says. "I might have chickened out if I knew what was coming, but I never miss my old life. I&apos;m crazy about what I get to do every day now." The Prison Entrepreneurship Program is housed in the Cleveland Correctional Center, a low, gray cinderblock complex surrounded by a concertina wire-topped fence in the pine woods an hour north of Houston. These days, Rohr spends most of her time traveling, meeting with donors and recruiting new inmates in scores of other Texas lockups. But she comes back to lead the course a day or two each week. On a morning last July, the 39 men in the program&apos;s current class file in from their austere cellblocks to a carpeted meeting room. They&apos;re mostly in their 20s and 30s, all in prison-issue blue sweatpants and T-shirts. Heavily tattooed, their skin is white, black or brown — normally iron dividing lines in prison. But in here, they all greet each other with warm, vigorous hugs. Rohr cues up some thumping dance music. "Prissy!" she calls. "Bambi!" In response, one by one, each prisoner shimmies and shakes up to the front of the room to the cheers and hollers of the rest. Every one of the drug dealers, armed robbers and murderers in the program gets one of these deliberately effeminate nicknames. It&apos;s one of several tactics aimed at getting them to drop their tough-guy facades and bond with one another. Amazingly, the ploy actually works. "Holding up that front in prison gets so tiresome. It&apos;s a relief to be able to be stupid and silly, to be the kid you never were," says Bruce Stubbs, a 25-year-old former methamphetamine dealer who was released last summer after completing the program. He&apos;s now doing clerical work at a law firm while taking classes at a Houston college. "Ms. Rohr gave up everything to get this program off the ground. You can see her sincerity. That&apos;s what lets her break down those barriers." After much trial and failure, Rohr has learned that the inmates need more than just legitimate business skills to make it in the free world. Many have serious psychological and substance-abuse issues that will trip them up again as soon as they walk out the prison gate. So in addition to classes on accounting and brand management, the program provides training in "life skills" — everything from opening a bank account to politely avoiding old drug buddies. Through a 14-hour day of classes and discussion, Rohr never stops radiating good cheer, smiling sunnily and leavening her lectures with jokes and teasing digs at the students, the staff and herself. Standing at her podium or prowling the room, she&apos;s a combination teacher, revival minister and motivational speaker, exhorting the men to believe they can succeed, while still holding them to account for their past mistakes. For all her warmth, she can also be a stern, even self-righteous judge — especially considering she has no formal training in this sort of counseling. The most common pitfall, Rohr tells the men, is getting involved with the wrong women. "When you first get out, you guys latch onto the first woman you see because you&apos;re so needy for female companionship," she lectures. "You have nothing to offer, and you go after these girls with nothing, who are trying to feed five kids — it&apos;s pathetic! Where&apos;s your manhood in that? "You guys think you&apos;re on a low, scummy level because you&apos;re in here. But you&apos;re not. You&apos;re great men. And if you&apos;d just believe that, and carry yourselves that way, you&apos;d attract great women." Later in the day, Rohr gathers the men in a circle. They spend a couple of hours discussing their family troubles and hopes for the future, like a bunch of Oprah guests. One man talks about his rage and depression over his wife getting pregnant by another man while he&apos;s been locked up. Another wonders how he can convince his teenage son to listen to his advice when he feels like such a dismal role model. "To see other guys bare themselves this way is really moving," says Daniel Ingle, 26, in for six years on a burglary charge. "This program is about learning how to live and how to think right." From New York to Oregon, at least half a dozen programs are trying to turn inmates into entrepreneurs. "Research suggests many individuals with criminal records possess high entrepreneurial aptitude, especially those convicted of drug dealing, and share common traits ascribed to successful entrepreneurs," notes Nicole Lindahl, assistant director of the Prisoner Reentry Institute at The John Jay College of Criminal Justice, in a recent monograph. A study by University of California, Santa Cruz economist Robert Fairlie, for instance, found that young people who dealt drugs were more likely than their non-dealer peers to choose legitimate self-employment later in life. Starting a business can in fact be an easier way to make a living than finding a traditional job, Lindahl notes, since ex-convicts are barred in many states from working in a range of occupations, from financial services to child care. And most prospective employers aren&apos;t exactly thrilled to see a felony record on a résumé. Certainly, self-employment isn&apos;t for every ex-con; many of them can barely read or do basic math, let alone manipulate a spreadsheet. Still, Lindahl writes, "even if only a tiny fraction of the vast number of people returning home from prison pursued self-employment, it could make a significant impact. If between 1 and 7 percent of people leaving state or federal prison next year started their own businesses ... 6,500 to 45,000 new businesses would be created in the United States." The theory sounds good. Solid data, however, are still in very short supply. These programs are only a few years old and include, at most, only a few hundred participants each — which means the whole movement is still too new and small to yield reliable information on its long-term success. "Starting and running a business is very difficult. Most people with business backgrounds don&apos;t succeed at it," notes Richard Greenwald, a senior fellow specializing in prisoner post-release issues at the Manhattan Institute. There are extra obstacles for ex-cons, Greenwald notes: "If you have to report to your parole officer at certain hours, that gets in the way of hustling for business." Indeed, of the 57 businesses launched by Prison Entrepreneurship Program grads, 25 have already closed down. But the biggest questions around programs like PEP is the extent to which they can get career criminals to permanently change their ways. The program&apos;s 9 percent recidivism rate looks great, but it includes some former inmates who have only been free for a few months. The same goes for a similar program run since 2004 by the Oklahoma Department of Corrections; of 317 inmates who have completed the training, only 5 percent have wound up back behind bars — so far. Michael Cevallos is a perfect example of the promise and the pitfalls of these programs. Last summer, I met him on a baking-hot day in Houston for a quick lunch at Jack in the Box. His moving company was so swamped with customers that he&apos;d had to rent an extra truck and hire three guys to help haul furniture. A compact, energetic man wearing a sweat-stained polo shirt and a neatly barbered brush of gelled-up hair, Cevallos had launched the business just two months earlier, upon his most recent release from prison, where he&apos;s spent a total of 23 of his 40 years on a series of burglary and drug offenses. "I started smoking weed at 8, and I was selling dope with my old man at 12," he said with a toothy grin. "I&apos;ve been an entrepreneur for a long time." It was PEP that inspired him to go legit. "Ms. Rohr is an extraordinary teacher, bro," he says. "She loves us unconditionally. She makes us want to do the best we can." That, however, isn&apos;t always enough. A few months after I met him, Cevallos was arrested for cocaine possession and shipped back to the penitentiary for eight months. It was a PEP staff member who told Cevallos&apos; parole officer that he had fallen off the wagon. That&apos;s Rohr&apos;s policy. "Drug offenders are dangerous. They rob, they steal and they need to be taken off streets," she says. "I believe in redemption and grace. But until people are rehabilitated, they shouldn&apos;t be released back to society." "These men have been takers their whole lives. 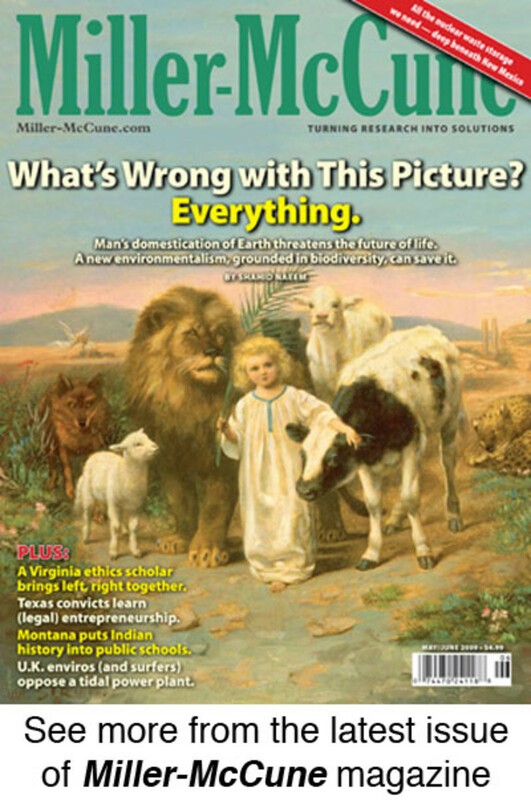 We want them to become taxpayers and donors and philanthropists."